The above prices are subject to an additional $195 for taxes/fees levied on flights that occur as part of the tour. The internal airfares ARE included (any exceptions are listed in red below), but we list the taxes separately on your invoice as they are beyond our control and can change at any time. 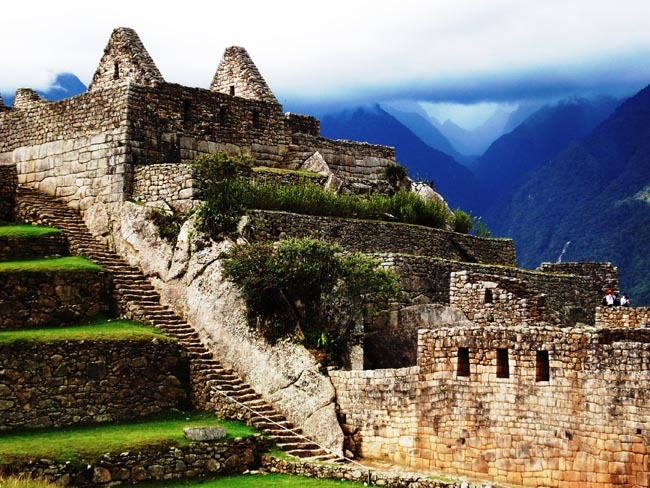 PLEASE NOTE: This tour requires a $1500 per person deposit due to the nature of internal flights which are instant purchase and non-refundable once issued. Optional Single Supplement: $2703 USD (number of singles limited). This tour may require a mandatory single supplement charge of $1531 if you join our share program and we are unable to pair you. 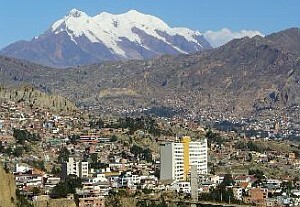 Today we fly to Ecuador (usually via Lima); we arrive in Quito and settle in our hotel. 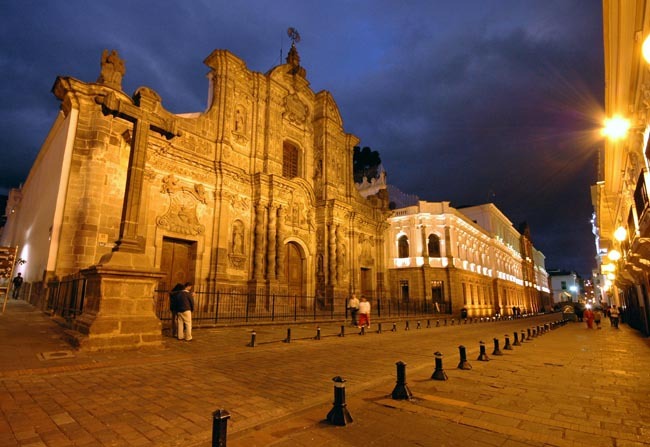 Quito is Ecuador's charming capital city, nestled against Pichincha Volcano high in the Andes. The Napo Cultural Centre (formerly the Yasuni Kichwa Ecolodge) is located on the south bank of the Napo River, the largest river of the Ecuadorian Amazon and the Yasuni National Park. The trip starts from the town of Coca in comfortable ecological roof canoes, outboard motor-operated. (as we use three different lodges in the Ecuadorian Amazon, the actual lodge used for your departure may vary). The canoe trip down the river takes about two hours; box lunch will be provided to passengers. During the navigation you will see birds such as herons, kingfishers, terns And other shore birds species and beautiful landscapes. Arriving at Napo Cultural Centre Kichwa Ecolodge, visitors are warmly welcome with a traditional drink, lunch at the lodge and immediately taken to their cabins amidst the teeming wilderness found on one of the most biologically diverse places on Earth. In the afternoon, a short walk down to the banks of the Napo River to enjoy a beautiful sunset on the beaches and islands. Return for dinner and rest. Please note that groups of fewer than 8 participants will not be accompanied by an Adventures Abroad Tour Leader for this Amazon portion (you will be very capably looked after by lodge staff & guides). * As this is an early morning flight, passengers with flight routings that land in Quito late on Day 1 might consider arriving a day earlier in order to rest up and avoid a "painfully early" start on this day. Breakfast and early departure on board the boat to visit an amazing parrot clay lick that with an easy access brings visitors face to face with approximately 11 species of parrots (including parrotlets and macaws) depending on the season, weather conditions and general good fortune (this activity is usually successful). We end this morning with a visit to the Interpretation Center "Kuri Muyu," handled by the women of the community here learn about the Kichwa culture, crafts, traditions and traditional use of natural resources directly to people in the community. We return for lunch and take a break at the lodge. Walk of one hour to climb up the observation tower of 35 meters, likely to see a variety of birds, howler monkeys, squirrel monkeys, toucans, parrots and sloths. Return to the hotel in a motorized canoe; traditional typical dinner. Visit around the community projects, talk about the Kichwa world view. Excellent opportunity to see more wildlife, ceiba trees, bamboo cane, vines and shrubs endemic from Yasuní. We return for lunch and rest at the lodge. Once at Añangu stream, you will board a small canoe and head down the river in a spectacular adventure through the forest with opportunities to see nightlife alligators and to listen to the sounds of nature at its purest. Return to hotel in motorized canoes, traditional typical dinner. We get up at 4:30 am to share one of the ancient customs of the Kichwa culture -- making wayusa to energize the body, and listen to the Kichwa songs. We then return for breakfast before taking a motorized canoe back to the city of Coca. You can also practice water sports such as tubing or regatta on the Napo River or simply relax and unwind. 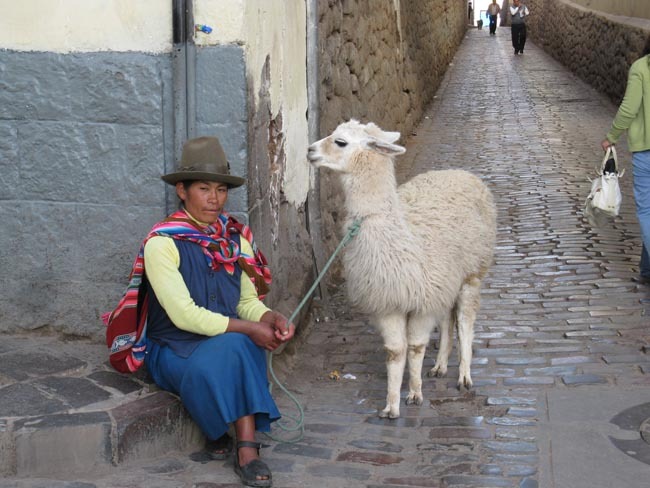 Today we tour old Spanish Colonial Quito, preserved by UNESCO as a World Heritage Site. 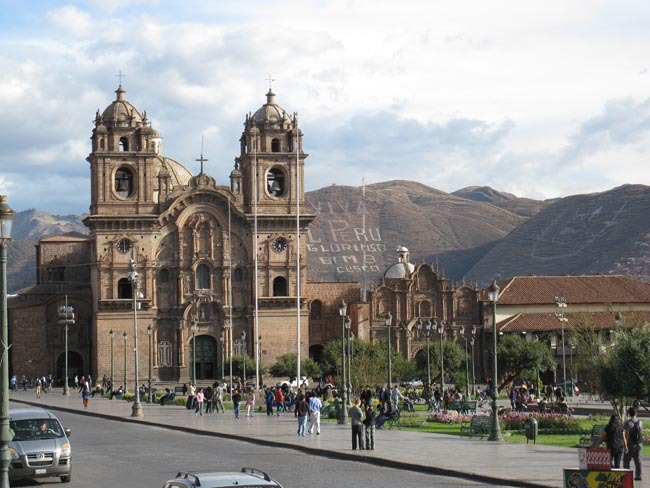 buildings, La Compania church, whose ornate facade and solid gold altars make it one of the most famous of South American churches. We visit the famous Panecillo Hill with its towering winged statue of the Virgin of the Apocalypse with views of north and south of Quito and the surrounding mountains. This afternoon we travel 22 km (14 miles) north of Quito to the Equator line monument, known as the "middle of the world," where you can stand with one foot in the Northern and the other in the Southern Hemisphere. We also visit the excellent on-site ethnographic museum with exhibits pertaining to the many indigenous peoples of Ecuador. Today we journey north to the Otavalo Valley region. 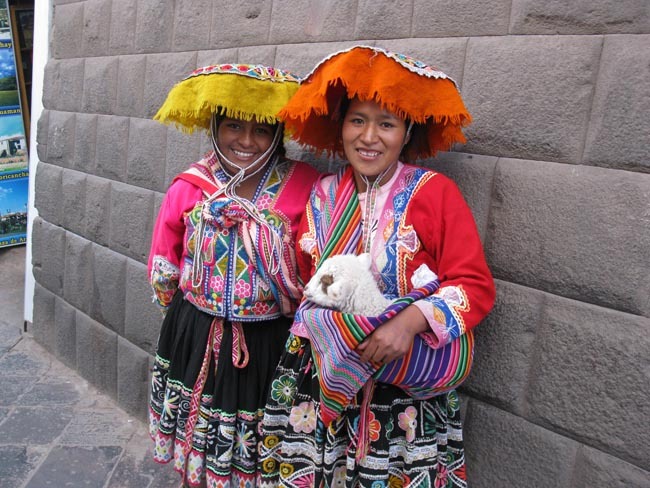 Otavalenos were forced to work 15 hour days weaving fabrics. chance to wander through the colourful handicraft stalls. 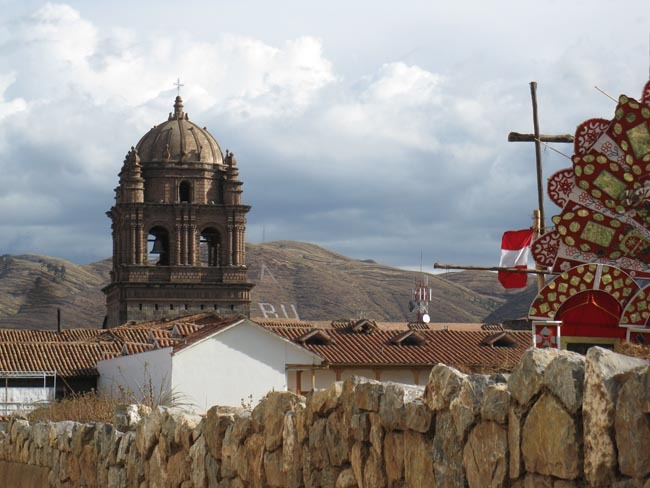 Our hosteria is located nearby the colonial town of Ibarra (2121 m/7,000 feet), known as the "White City" since many of it houses are colonial style, red-tiled and whitewashed. We’ll take the Pan-American Highway southwards and take a side road to discover the impressive volcanism, flora, and bird-life that this national park protects. A visit to the Interpretation Center and the Limpiopungo Lake as well as a short easy hike will let us enjoy this natural wonder. 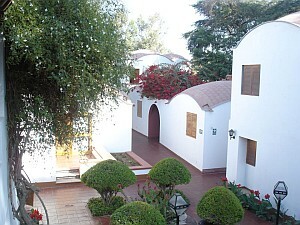 The area is also home to a number of exceptional haciendas, some of which date back to the 16th century. 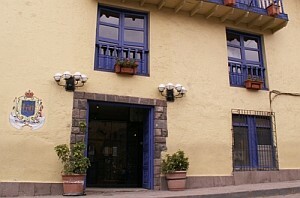 La Cienega Hacienda is located near the village of Lasso near the foot of Cotopaxi and has been witness to centuries of important events in the history of Ecuador. 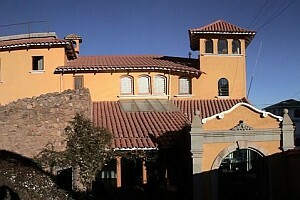 Overnight at Hosteria La Cienega (Lasso area). Today we continue our journey to Banos. 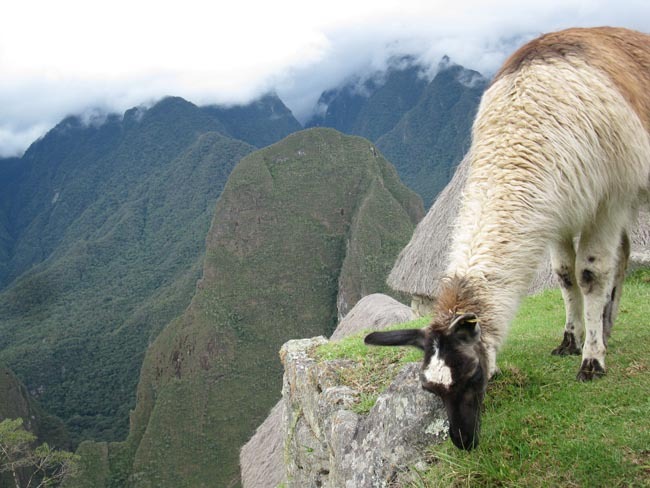 En route we will visit Cotopaxi volcano, where we can have an interesting walk in the Paramo (moorlands), enjoy beautiful views, and learn more about the flora and fauna or the area. We continue our journey, stopping in Pillaro where we will visit a traditional workshop of masks that are used in the Pillaro Devil parade, an important cultural expression of the local indigenous people. We arrive in Banos, a small town whose elevation gives it an extremely agreeable climate and the surrounding mountainsides are brilliant green against the white summit of the Volcano Tungurahua. The word Banos means "baths" and, as the name indicates, the highlight is the numerous hot spring baths in the area. 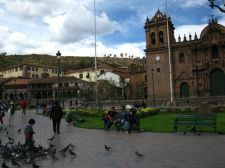 Today we have opportunity to visit the hot springs as well as wander the streets and market of this picturesque town. 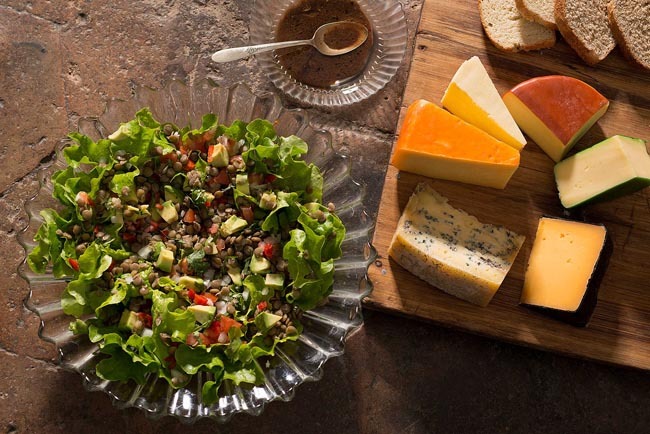 You can also hike into the nearby hillsides, along farmers' donkey trails through fields of corn, passion-fruit, and various other local products. A must-see is the Basilica dedicated to the Virgin of the Holy Water, credited with performing many miracles in the Banos area. Before departing Banos, we'll have a short walk to view one of the most impressive waterfalls in South America, the Devil's Bowl. At El Manto de la Novia we can experience a cable car ride over the Pastaza River Canyon. After lunch we'll travel through open farmland flowing over the high ridges of the Western Andes to Riobamba. travel by rail as far as Alausi where we'll break for lunch. 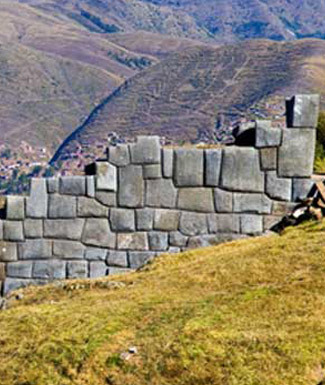 Afterwards we’ll continue by road to Cuenca, detouring to visit the Archaeological Complex of Ingapirca, the best-preserved and most important Inca site in Ecuador. 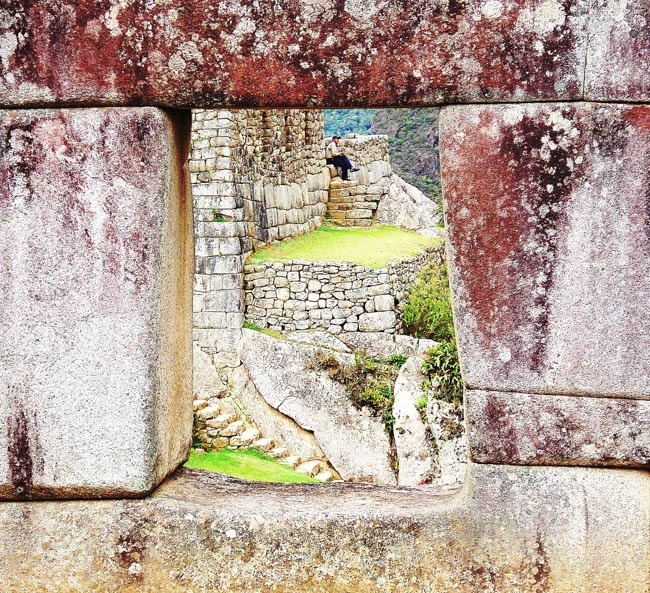 Though not on the same scale as, say, Machu Picchu, the ruins include a large oval construction once used for ritual and astronomical purposes. Just outside the ruins, the Museo Sitio de Ingapirca displays a skeleton, tools, and other artifacts recovered from the area. 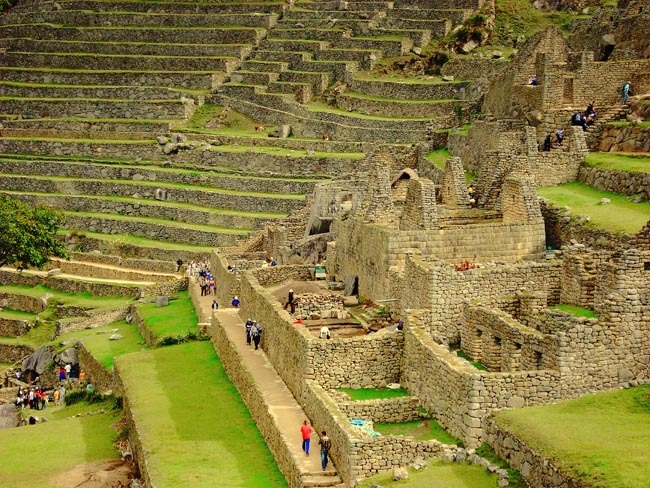 Once the site of an Inca settlement, the Cuenca of today today is considered Ecuador's most beautiful city. Its historical connection with Spain is marked by narrow cobblestone streets, quaint parks and romantic plazas. 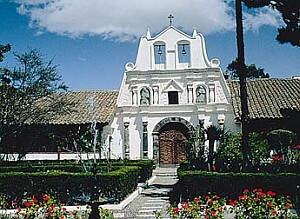 Charming adobe houses, wrought iron balconies, and religious art treasures capture the spirit of centuries long past. Cuenca, almost hidden away in a southern valley, was isolated until recent times; it wasn't until 1960 that paved roads were built to Quito and Guayaquil. Today Cuenca, Ecuador's third largest city, is surrounded by small villages whose citizens create intricately detailed jewelry, beautiful ceramics, and masterfully designed hand-woven shawls. Overnight in Cuenca (2648 m/8,738 feet). 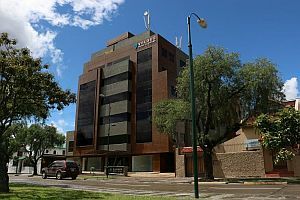 This afternoon we visit the Museo del Banco Central, which contains a permanent collection of black and white photos of 19th and early 20th century Cuenca, as well as displays of art and archaeological pieces, and ethnographic dioramas. We also visit a Panama hat factory. In 1835 Manuel Alfaro, a Spanish entrepreneur, arrived in the port of Guayaquil in the province of Guayas. He settled in nearby Montecristi and quickly realized the economic potential of the toquilla hat setting up his own chain of production from the straw plantations to circuits of weavers. His hats were soon being exported from the ports of Guayaquil and Manta to Panama which was quickly becoming an important centre and staging post for international trade and travel. Here Alfaro opened a commercial centre selling his hats, cacao and pearls, thus beginning the association of the Ecuadorian toquilla hat with Panama. Today is yours to explore and experience this charming town on your own. 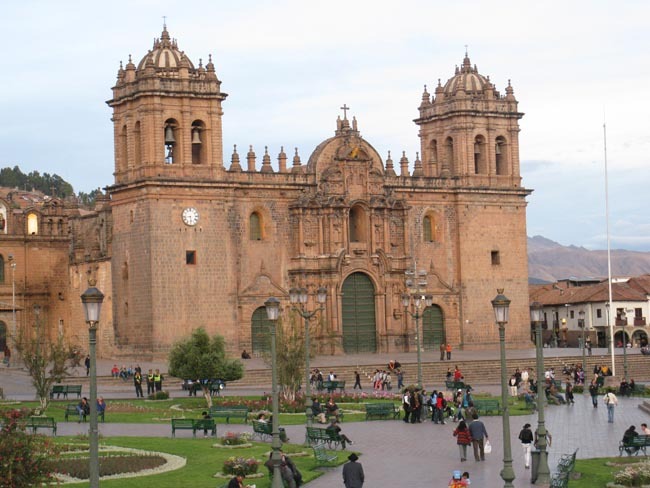 This city, a UNESCO World Heritage Site, has been named the best city in which to retire by Travel and Leisure magazine; indeed, these days more than 8,000 US and Canadian citizens make Cuenca their home. Today we travel by road to Guayaquil via Cajas National Park. highlands. Keep your eyes peeled for the many bird species that make the park their home, especially for the silhouette of a soaring (and extremely rare) Andean Condor which can sometimes be spotted here riding the thermal up-drafts. We continue to the coast with a stop at a cocoa plantation and learn about its cultivation and the production of Ecuadorian chocolate. Our destination is the main port city of Ecuador, known as a gateway to Pacific beaches and the Galapagos Islands. Stretching along the Guayas River is the waterfront Simón Bolívar promenade, home to La Rotonda monument. Departure from Guayaquil to San Cristobal in a 2-hour flight. Upon arrival, passengers are picked up at the airport by our naturalist guides and taken on a ten-minute bus drive to the pier to board the M/V Galapagos Legend. 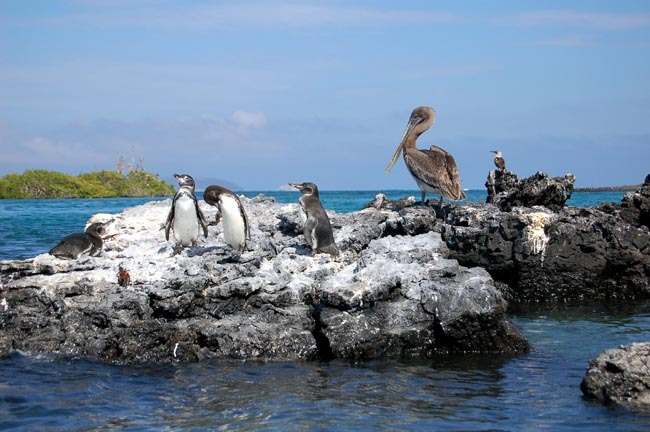 An archipelago of 12 large and several hundred smaller volcanic islands occupying a 4800 sq km (3,000 sq mile) area about 1000 km (620 miles) west of Ecuador, the Galapagos Islands have become one of the world's premier adventure travel destinations. 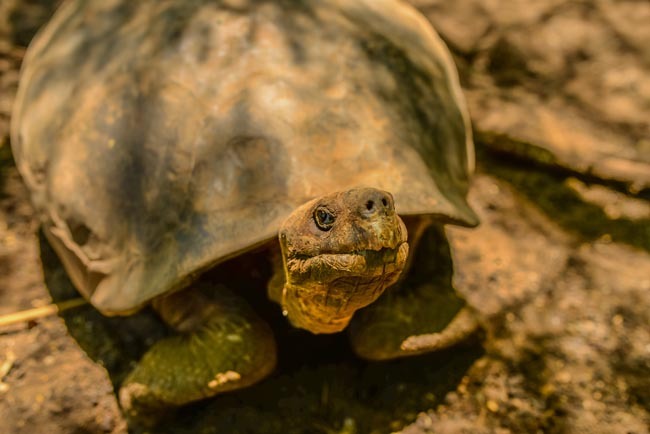 Over the course of your visit, you'll enjoy up-close views of unusual, specially-adapted animals, plants and terrains including sea lions, tortoises, iguanas, land and sea birds, volcanic landscapes, unusual cacti and vegetation. Little has changed about the islands since Charles Darwin's visit in 1835 to "this little world within itself" inspired his first theories of evolution. Nearly the entire archipelago is a natural sanctuary where you'll have thrilling encounters with some of the world's last completely untamed wildlife that has never learned to fear the presence of humans. 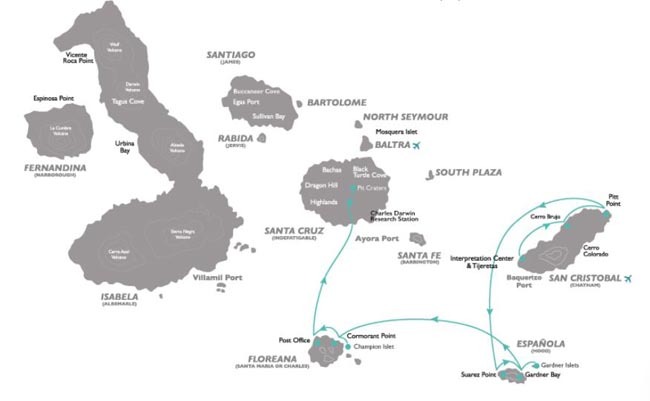 We will be navigating the Galapagos on board the M/V Galapagos Legend, a 110-passenger luxury expedition ship totally converted in 2001 and recently renovated. The M/V Galapagos Legend has all-new passenger accommodations with 1800 sq m of social areas and was built with marine certified materials qualifying with Safety of Life at Sea specifications. All cabins are booked in "outside" Junior Suite cabins with plenty of space for luggage in the wardrobe closet. Private bathrooms feature hot and cold water, shower, and a hair dryer. Also aboard, a highly-trained crew, 24 hour physician, and naturalist multilingual guides. An auditorium for conferences, spacious social areas, dining room, 24 hour coffee bar, swimming pool and sun decks, observation platforms, cocktail bars, long distance calls, fully air-conditioned. Dry landing (no need to step into water upon landing). The interpretation center is full of interesting information and offers the perfect overview to the formation of Galapagos, its significance in the world, threats and conservation efforts. Followed by a hike to Frigatebird Hill (Cerro Tijeretas) we will have great looks at both species of frigatebird, with the bonus of a beautiful view of the bay below. Return to ship for passenger welcome and briefing; there is a presentation of the crew. At this time a safety drill is practiced. Free time on board. After dinner a guide's briefing on next day activities in the auditorium. * The cruise portion of this itinerary has been provided provided by the cruise operator and should be taken as guidance only. Last minute operation considerations and national park policies can result in alterations and deviations from this schedule, sometimes at late notice. Such changes are the prerogative of the cruise operator over which Adventures Abroad has no control. Wet landing (you will have to step into shallow water and walk to shore - see your pre-trip notes for suggestions re footwear). One of the most stunning beaches in all of Galapagos, the long, white, sandy beach, lapped by turquoise waters is home to a colony of Galapagos sea lions, indifferent to the humans that walk amongst them. The Hood mockingbirds, endemic to this particular island, will be eager to inspect the visitors and satisfy their innate curiosity. Darwin’s finches may also join the throng including the reclusive warbler finch. We can also snorkel here from the beach, in the shallows of the bay. Dry landing. One of the highlight visits of the trip. Punta Suarez seems to have everything – a naturalist’s paradise. A slew of marine iguanas and sea lions greet us at the landing site from where our walk continues with close encounters of boobies, endemic lizards, gulls and even a dramatic blow hole. The oldest extant island in the archipelago it is our only opportunity to commune with the endemic waved albatross during their breeding season between April and December. With luck, we can watch their complex courtship display. Return to ship; Free time on board. Guides briefing on next day activities. Wet landing. A very short walk from the beach leads us to the famous Post Office Barrel. Claimed to have been first setup in 1793 by Captain James Colnett it remains the oldest functioning “post office” in the Pacific. The system was that whalers and fur sealers would leave addressed letters in the barrel to be picked up by homeward bound colleagues. In the spirit of maintaining tradition visitors today will often take letters and hand-deliver them in their home countries. One of the favorite snorkeling sites in the islands. Devil’s Crown, an eroded volcanic cone, is home to an abundance of fish and marine animals. We will swim with big schools of yellow-tailed surgeonfish, salemas and creole fish and with luck may spot turtles, spotted eagle rays, parrotfish, and even hammerhead sharks! The jagged ëcrowní is a roosting area for boobies, noddies, tropicbirds, and frigates. 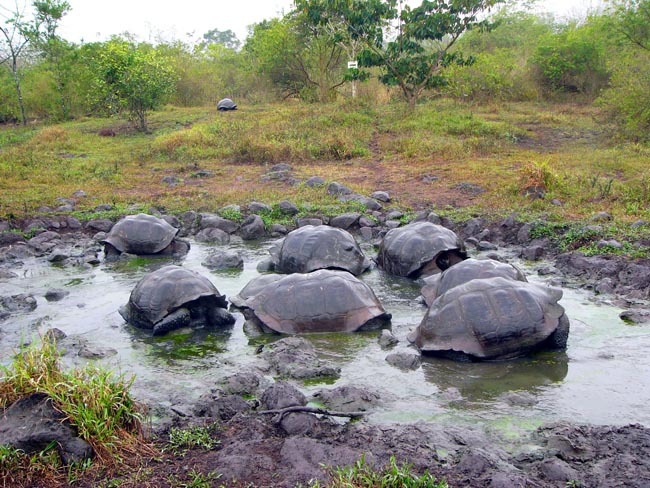 In the central highlands of Santa Cruz Island we have our best opportunity to interact at close quarters with totally wild, Galapagos giant tortoises. A short walk among these huge, 600lb, reptiles will also offer the chance for more highland species, especially several species of the famed finches. Wet landing. The perfect spot to enjoy our water activities of snorkeling, kayaking or the glass-bottom boat. Expect to see lots of fish species including king angelfish, surgeonfish, parrotfish, damsels, rays and sharks. From the land portion of the visit there will be sea lions and basking marine iguanas with herons and turtles in the mangrove areas. We might even discover some antique ceramic relics left behind by previous settlements. Eden Islet is off the western coast of Santa Cruz. It offers opportunities to see Nazca and blue-footed boobies, reef sharks, and banks of endemic bream fish, either from the panga or while snorkeling. Dinghy ride at the entry of the Itabaca channel in a lagoon with turquoise water, where we can observe sharks, blue footed boobies, and different kinds of fish. After the visit, passengers will be transferred to the airport for their return flight to the mainland. Departure from Quito (if you are booking your own flights, please do not book anything from Quito that departs any earlier than 8pm). * PLEASE NOTE: As an exception to our general policy regarding the inclusion of tips in our tour pricing, gratuities for the ship's crew are NOT included in tour price. (We have found that trying to pre-pay tips on your behalf is not practical, for a number of reasons). Accordingly, we suggest that you allow approximately USD 90-100 total per passenger for satisfactory service. 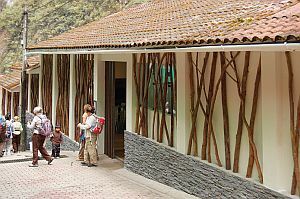 El Mapi is located in the charming village of Aguas Calientes at the foot of Machu Picchu. 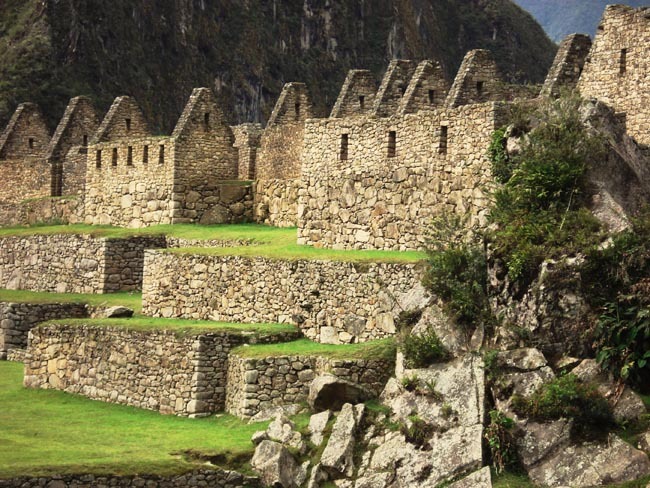 This centrally located ...	is only a few minutes away from the train station "Puente Ruinas", where the buses leave for Machu Picchu. 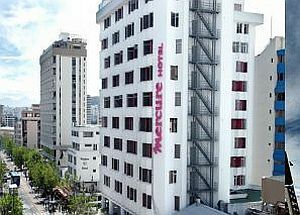 Quito ALAMEDA Hotel Mercure offers: Rooms with Wi-Fi, located near the financial and commercial center of Quito, restaurant, coffee shop ...	coffee, lunch), bar, 24-hour front desk, non-smoking rooms, lift, safe, soundproofed rooms, luggage storage. 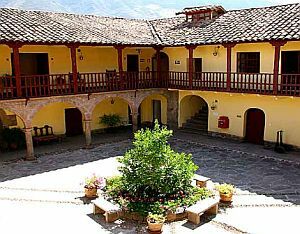 Hosteria La Cienega is a historic hacienda located in the heart of the Ecuadorian Andes. Situated just an hour and ...	half from Quito, Ecuador on the outskirts of Volcano Cotopaxi and surrounded by the cordillera’s most beautiful snow-capped peaks, the manor has been receiving guests for the last twenty-five years. Rooms are cozy and full of character. M/V Galapagos Legend is a 110-passenger expedition ship with 1800 sq m of social areas and built with marine certified ...	qualifying with Safety of Life at Sea specifications. All cabins are booked in outside cabins; private bathrooms feature hot and cold water, shower, and a hair dryer. Also aboard, a highly trained crew, 24 hour physician, and naturalist multilingual guides. An auditorium for conferences, spacious social areas, dining room, 24 hour coffee bar, swimming pool and sun decks, observation platforms, cocktail bars, long distance calls, fully air-conditioned. 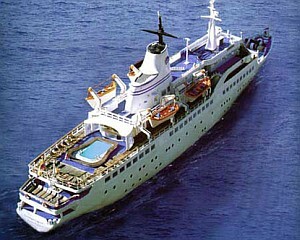 Breakfast and dinner daily (hotels and restaurants); all meals on ship. All sightseeing and entrance fees for sites noted as 'visited' in the detailed itinerary (including Galapagos park entry fee). Gratuities for local guides, drivers, restaurant staff, porters. Airport transfers for land & air customers arriving / departing on tour dates. International airfare to/from the tour. Tour Leader gratuity, some lunches (see tour itinerary), drinks, personal items (phone, laundry, etc), domestic and international air taxes (if applicable). Airport transfers for Land Only customers. Optional trip cancellation insurance. Tips for ship's crew are NOT included (allow USD 150 per person). Our post-reservation trip notes offer further guidance on optional meal costs, shopping, useful items to bring, recommended reading etc. Mainland: The cool and dry season runs from May to October. Outside this time you will encounter warmer and perhaps rainy/misty conditions in the highlands but serious heat/humidity are only a consideration in the isles. Islands: Hot Season (warm-rainy) - December to April. Average air temperatures range 25-33C (77-90 F) on land and 23-26C (73-79 F) in the water, ideal for snorkeling. It may rain occasionally in the afternoons for an hour or so. The ocean is generally calm due to the absence of the southeast trade winds. The Cool Season (windy-dry) - June to November. The cooler season sees a drop in temperatures to 18-27C (64-80 F) on land and 18-23C (64-73 F) in the sea. Rainfall is low, though the islands may seem somewhat moist as an early mist covers the sky; usually this burns off by mid-morning. The seas are moderately strong – some surge, choppy waters, and waves should be expected (though larger swells are rare year-round). Land transport throughout by private air-conditioned motor coach, 24-36 seats depending on ultimate group size (see 'group size'). Though we will have some full bus days, road travel is not particularly arduous as there are plenty of stops of interest. Roads are in good condition though winding on some stretches. Scenic VISTADOME train between Aguas Calientes and Cuzco; internal flights via scheduled local carrier. Baggage handling service is usually available though you should be independent with your luggage, especially at airports. 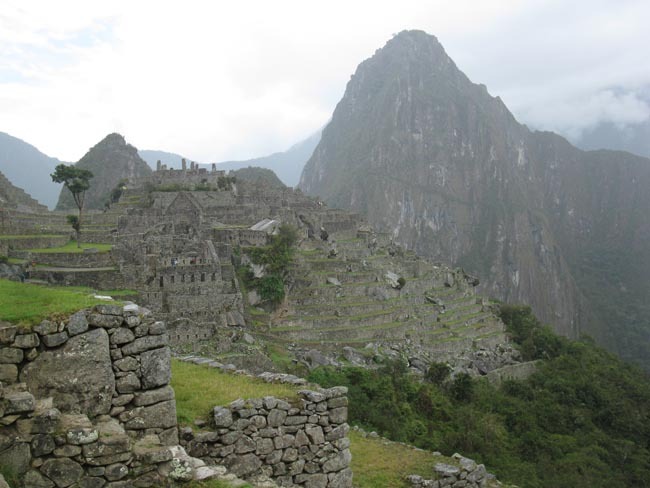 Our difficulty rating of "Level 2" reflects the generally ambitious nature of our program, which features full days of travel and sightseeing, plenty of walking at sites that may be quite large and feature uneven/cobbled surfaces, stairs, heat, and some remote locations. You must also be prepared for short walks to dinner when we dine outside hotels, and to be fully-independent with your luggage in the event that porters are not available. While we don’t include any strenuous activities such as extended hiking or cycling, you must be steady on your feet and able to fully manage yourself and your belongings. And as always on any of our tours, if you rely heavily on a cane or any other mobility device, this tour would not be suitable for you. Though most people are not seriously affected by altitude on this trip (3000m/10,000 ft +), we require that all participants submit a “Self-Assessment” form confirming their suitability for this journey. And, of course, you should consult with your physician should you have any pre-existing conditions that might be affected by travel to high elevations. We suggest that you preview our form, which includes more detail regarding what you can expect on tour, by clicking the “Resources” tab at the top of this page. 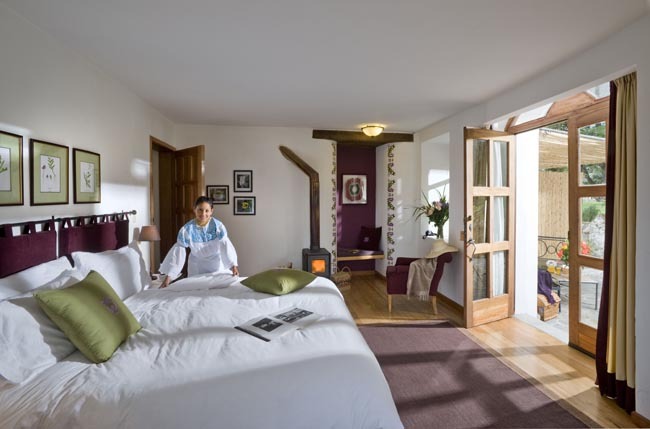 Well-located, heated/air-conditioned, mid-range (3-star) hotels with en suite toilet and bath throughout. The Amazon lodge is a little more rustic, but still very nicely appointed. The MV Galapagos Legend is one of the most comfortable and stable boats sailing the Galapagos. With space for 110 passengers, the fully air-conditioned ship offers all the amenities of a cruise liner yet small enough for that intimate experience with nature. All cabins are booked in outside 'Junior Suite' class (view cabins on www.gogalapagos.com). Private bathrooms feature hot and cold water, shower, and a hair dryer. Snorkels & masks provided free. 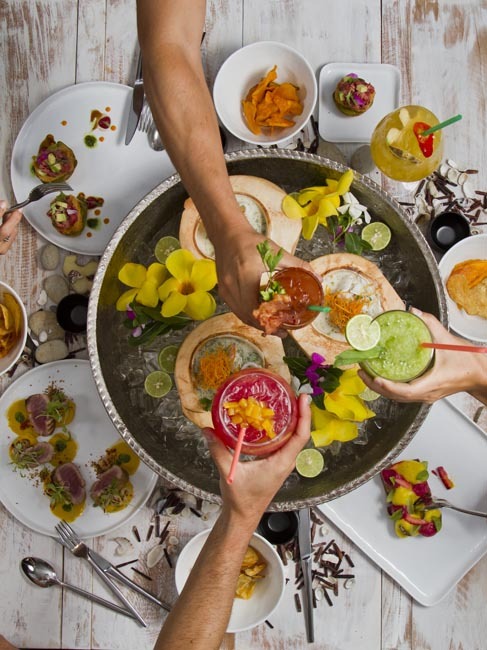 Adventures Abroad is limited to a maximum of 2 single supplements per sailing by the Galapagos cruise operator; any additional singles will attract an up-charge. Tour Leader and driver/s on mainland only. On the cruise, ship's crew and naturalist guides provide expert leadership and will manage your overall islands experience. Tour Leader throughout, local driver/s, local guides at several locations.